Coeurage Theatre Company's 2011 season debut is the world premiere of Eric Czuleger's black comedy No. 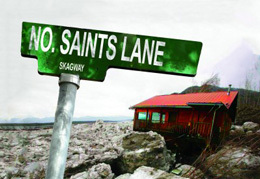 Saints Lane. Czuleger authored two successful plays for Coeurage's inaugural season last year, Head Over Heels and L.A. Lights Fire. Both plays were entries in the Hollywood Fringe Festival, in addition to receiving full production runs. No. Saints Lane was written for and stars Cal State Fullerton's 2009 M.F.A. Acting class. The ensemble has developed the play over the last three years. Coeurage Theatre Company's production is directed by KPCC's Steve Julian. The play follows Mer Hicks and her "not quite right" daughter Dizzy as they weather a blizzard in Skagway, Alaska. Mer and Dizzy have been running from Mer's husband Hunter ever since he returned from the Special Forces, completely insane. Mer elicits the help of Jay, a half-blind fish canner from Skagway to kill Hunter so that Dizzy and Mer can finally stop running. When Jay fails to kill Hunt, and Mer fails to have Jay arrested - the blizzard blows in and everyone is locked inside a small bungalow on North Saints Lane. Director Steve Julian recently celebrated his tenth anniversary as the morning voice on 89.3 KPCC, Southern California Public Radio. He has narrated books, documentaries and industrial material. He studied theatre at Cal Poly Pomona and has appeared in numerous theatrical productions, most recently at Sherry Kinison's Grove Theatre (Jacob Marley in "A Christmas Carol"), Inland Valley Repertory Theatre (Martin Vanderhof in "You Can't Take It With You"), HotHouse at the Pasadena Playhouse, Wicked Lit, Parson's Nose (where he also is a board member), and DramaWest. Steve writes about theatre for LA Stage Times and at www.stevejulian.com and this year co-founded the literacy nonprofit, Hear Me Read, which pairs full-cast recordings with classic children's literature. Eric Czuleger' s plays have appeared at the Actors Theatre of Louisville, as well as theatres in Cedar City and St. George, Utah, and the Orange County and Los Angeles areas. He is the recipient of the Linda Wolverton Playwriting Scholarship, The Dramatist Guild Award, and has been a Regional Finalist for the John Cauble Award. He was one of the youngest comedians to ever perform at The Comedy Store. No. Saints Lane stars Coeurage Theatre Company members Joe Calarco, Kirsten Kuiken, Jeremy Lelliott, Adam Navarro, and Meredith Schmidt.